Don’t let the cold weather fool you, visiting Milwaukee during the month of December yields a bunch of cheery events, some of which are connected to the winter holidays and others that are just plain fun. If you do manage to brave the below-freezing temperatures to get out and explore this Wisconsin city on the west shore of Lake Michigan, you'll be greeted by a variety of holiday lights, decorations, and celebrations. Although December starts out relatively warm with an average high of 40 degrees Fahrenheit, the highs fall to 31 degrees by December 3; meanwhile, lows drop from 28 to 20 degrees Fahrenheit over the course of the month, resulting in an average temperature of around 29 degrees. Fortunately, though, the city only sees about eight days of precipitation in December, resulting in anywhere from one to four inches of snowfall. To make matter worse, wind speeds stay at above 14 miles per hour throughout most of the month, making it feel even colder out than it is. However, humidity levels stay at zero percent throughout December, which means you won't likely feel the chill in your bones like in some wetter winter climates. Due to the severity of the cold this month, you'll need to pack plenty of layers and warm articles of clothing including long-sleeved shirts, sweaters, pants, and thermal undergarments to stay warm this month. A windbreaker and heavy winter coat will also go a long way to ensuring the wind chill won't penetrate your layers (and make it easier to get comfortable once you're indoors). Comfortable, waterproof shoes are also recommended, especially if you plan on exploring Milwaukee's many outdoor lighting displays and attractions. From a European-style Christmas market to performances of “The Nutcracker,” and even a bus tour that celebrates who bakes Milwaukee's best festive treats, there are plenty of events happening in Milwaukee this December to get you in the holiday spirit. 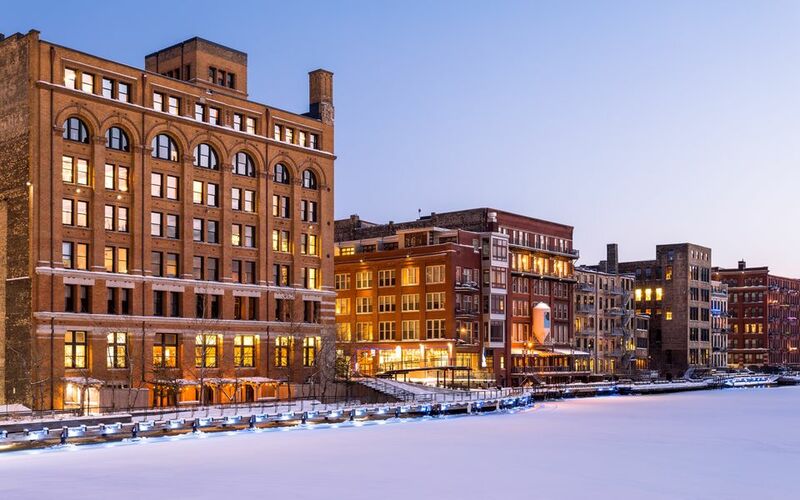 Many of these events are family-friendly and kid-oriented, perfect for multi-generational groups, and if you have limited time, you can also simply stroll the downtown-Milwaukee area where city streets are all aglow with holiday lights and decorations. The German Christmas Market of Oconomowoc: Quickly becoming an annual tradition for Lake Country residents, this year's market features outdoor beer gardens serving German beer, over 30 huts filled with vendors selling artisan-made goods (many linked to the holidays, such as tree ornaments and house décor), and live polka music. Holiday Lights Festival: From mid-November through the first of the new year, over 500,000 lights will illuminate downtown Columbus — especially near Cathedral Square and Pere Marquette Park as well as by City Hall. 2019 marks the 106th year of this festive event. Christmas in the Ward: The Historic Third Ward invites guests out on the first Friday in December for fireworks, visits with live reindeer and Santa Claus, and a tree lighting ceremony to kick off the month of shopping and fun activities. Christkindlmarkt: In its second year in 2018, the West Allis Farmers Market’s annual shopping event features German mulled wine, hot chocolate, and vendors selling a mix of locally made and imported products to help get your holiday shopping started. Milwaukee Ballet’s “The Nutcracker:" Hosted every year by Milwaukee Ballet, performances bring together 150 students receiving instruction from the Milwaukee Ballet School & Academy, plus an additional 50 dancers, for performances throughout the month. Due to its proximity to Lake Michigan, the windchill can be even colder than more landlocked cities in the northern United States; so you'll need to be extra prepared for surviving the winter here; it's better to overpack layers than to not have enough on your trip. In addition to the Milwaukee Ballet's "The Nutcracker" performances, various theaters and venues across the city will be presenting holiday shows throughout the month; however, tickets for these limited-run productions are likely to sell out so book your tickets before your trip to make sure you have a seat. By the end of December, Milwaukee will likely be covered in fresh snow, and there are some great places to go sledding in the city all month long including a number of public parks and giant hills perfect for this winter pastime.